Louis XIV described the Alsace-Lorraine region as a beautiful garden. There are various walking and cycling routes through the countryside, but one of the best ways to see Alsace-Lorraine is by boat. There are many attractions in Alsace-Lorraine and visitors can choose to concentrate on doing a wine tour of the region or a military history tour of the World War I battlefields, cemeteries and monuments. There are some charming medieval villages and cities to explore as well. Less than an hour's drive from Strasbourg is the city of Mulhouse, which is worth visiting for lovers of the mechanical. The city is home to the National Automobile Museum, and the French Railway Museum. 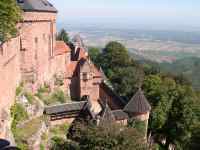 Other things to see and do in Alsace include a visit to Haut-Koenigsbourg Castle, which has a history going back nine centuries. The capital city of Lorraine is Nancy, a charming city with a very fine central square called Place Stanislas. This square has magnificent golden gates and fountains and is surrounded by some lovely old buildings, including the Museum of Fine Art. Other attractions in Nancy include the beautiful Pepiniere Park and the Montsec American Monument, which is dedicated to all those who fought and died in the region in World War I. Lorraine is full of military history and those who are interested in such things should not miss out on a trip to Verdun, which has a great museum and numerous monuments. We are looking for contributors for our Alsace Lorraine travel guide. If you are a local, a regular traveller to Alsace Lorraine or a travel professional with time to contribute and answer occasional forum questions, please contact us.